Become the market leader in service! Be the place to work! Businesses that replace an employee will spend 16-20% of their annual salary to replace them and a high turnover will impact the employee productivity that then will affect the whole business. By training the Customer Service employees, a business will generate a better bottom line of sales. Companies that invest in their employees can have a 24% higher profit margin compared to those than do not. 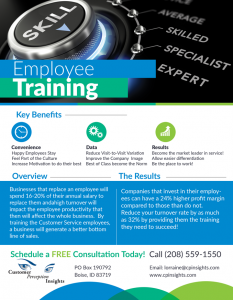 Reduce your turnover rate by as much as 32% by providing them the training they need to succeed!